Had lots of fun with this yesterday. 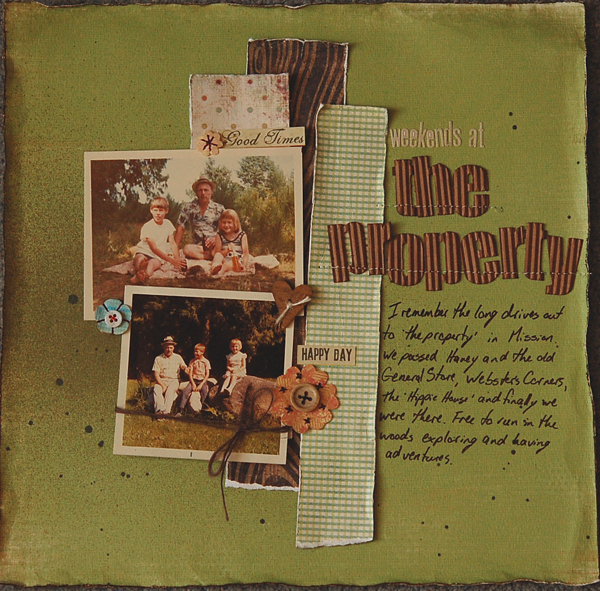 Inspired by ScrapFit Workout #63 sketch and Glitter Girl’s challenge to scrap vintage photos. These photos are from when my family had about five acres of land outside of the city that my dad wanted to retire on ‘someday’. It was uncleared at first, but my dad cleared an area at the front for a house that he never built. We would go out on weekends and my brother and I would run in the woods exploring while my dad cut down trees, planted trees or whatever project he had at the time. My parents sold the land when I was about 8 or 9 because the taxes went up drastically. We had so many great adventures there. The colors you chose are perfect for the vintage photos—you did a great job with the sketch too—love it! Thanks for workingout with ScrapFIT! cool page love how yoe made the title. WOW! I love this vintage vibe layout! Thanks for working out with us at ScrapFIT! This is so awesome! Love the older photos & the vintage vibe. Perfect papers for this! Great interpretation of the sketch 🙂 Thanks for working out with us at ScrapFIT!